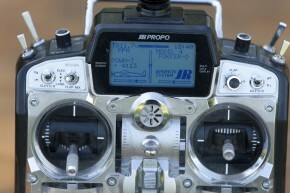 Radio-controlled model aircraft take the term ‘hobby” to new heights. it is one of only eight Class one estuaries in British Columbia and provides habitat for 145 bird species—more than 70,000 birds. It is also home to 218 plant species, 29 fish species—including all five species of pacific salmon—and innumerable species of intertidal creatures. From a distance it may look like child’s play, but these radio-controlled airplanes are a far cry from being just toys. Model airplanes that can sometimes cost well into the thousands of dollars, demand equally thousands of hours of construction time, and can be in certain cases one-third the size of the real thing, are a mighty major departure from a little balsa-wood flying plaything of the sort that you might take to the park with the kids on a sunny Saturday afternoon. 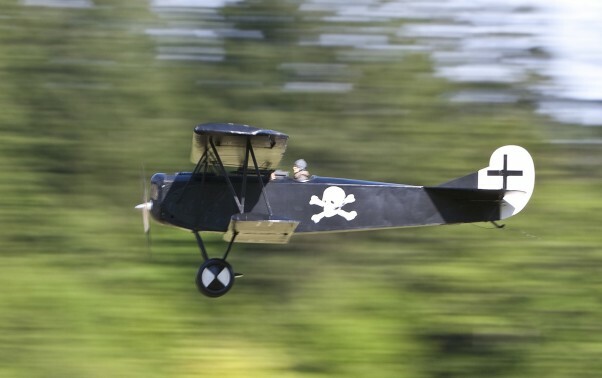 Members of the Radio-Controlled Aeronautics Association of the Comox Valley have been flying their amazing craft for well over two decades. Secretary Tom Feenstra has been a member for a quarter of a century and his enthusiasm for a challenging and sometimes costly hobby has never wavered. Right now he’s in the process of completing a flying Chance-Vought Corsair fighter plane that he has been working on for many months in his home workshop. The Corsair was the plane used by ‘Pappy Boyngton’s Black Sheep Squadron in the old TV series of that name. And it’s going to be big. It will boast an 86-inch wingspan and the wings will have to be dismounted so the plane can be transported in a pickup. The main construction is composed of that mainstay of hobbyists for decades—old-fashioned balsa wood, and then will be finished with fiberglass cloth. The aircraft of the Valley club fly regularly at a field owned by club president Frank McCrindle at his Merville property on Gunter Road. As for his own involvement with the hobby, Feenstra says he has always liked aviation and military history. At the same time, from when he was a kid, he liked building scale models. So, one sort of followed another as in, if you are going to build a model, why not build one that actually flies rather than being static? And that was how it happened. As mentioned, there are the crashes, and that too is part of the learning process. As real aircraft do crash, albeit rarely, the models crash a little more often. Feenstra notes there are many approaches to the hobby. The truly dedicated—especially those with sufficient time to devote to crafting—create scratch-built models, much as he is doing with his Corsair fighter, but there are also kit models, largely produced in China, that he admits are very impressive. At the same time he is creating his Corsair, he is also putting the finishing touches on a Chinese manufactured Spitfire. In Feenstra’s case, he favors gasoline engines. Those come in two types both four stroke, burning either gasoline or what is known as ‘glow-fuel’, which is a combination of methanol and nitro and is very expensive, and two-stroke, using the sort of mixture of gasoline and oil used with chainsaws and outboard motors. Don Loper's Supercub takes flight. The gasoline engines are relatively costly. The one that is going into the Corsair—it looks remarkably like a very small motorcycle engine—was $500. A less elaborate two-stroke would cost around $300, he says. As for the options the hobbyist can embrace, the sky’s the limit, metaphorically speaking, and the range therein runs the gamut to be found with real aircraft from regular single-engine planes to multi-engine, to stunt planes to helicopters. There are land planes and float planes, and even jets designed to belly land. In terms of multi-engine, a local endeavor was the construction of a four-engine Lancaster bomber of the sort that did stalwart duty in Europe in World War Two, and also flew out of CFB Comox for a number of years after the war. Two members of the local club created the Lancaster. And, as mentioned, they can range from toy size to one-third the size of the real thing. Many of the World War Two planes are one-quarter size. Then when it comes to the matter of flying an entirely new set of skills must come into play. “I recently lost a Spitfire because I became disoriented,” Feenstra says. “You need good eyesight and you have to be on top of what your plane is doing at all times. A Spitfire will do 100 miles per hour. You have to react quickly at that speed. Learning to fly the radio-controlled craft isn’t entirely different from learning to fly the real thing, Feenstra says. “It’s not a simple matter to learn to fly,” he says. “An instructor definitely has to help you. He’ll stop by helping you to land, which is really difficult, but if you get into problems, with the buddy-cord system (that is, two hands at the controls like a two control driving school car) he can take over if you get into a jam. There is, by necessity, as Feenstra explains, a distinct need for insurance. Indeed it is demanded. As the Comox Valley club is a member of MAC (Model Aeronautics Association) it must only fly in sanctioned fields, not in a back field or city park and great care must be taken in dealing with the aircraft. He adds that there is always a possibility that a wayward plane might head toward a highway and crash into a car, leaving a potential for a fatal accident. Feenstra explains the ‘radio’ aspect of the ‘radio-controlled’ facet of flying such aircraft. After all, the radio is the nerve-centre of operating these planes. First there is the matter of cost. A good radio, he says, can run you about $500, but he adds you don’t want to get a cheap one because the welfare of that costly airplane depends on it. He uses a 2.4-megahertz radio that is designed so that no other radio being operated can interfere with yours. 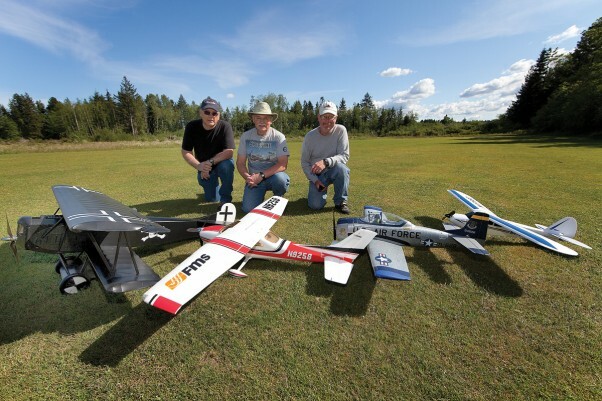 While the Comox Valley club flies virtually every Sunday at their local airfield—and visitors are certainly welcome—Feenstra says, most attendees are normally the modelers themselves. However, a larger meet will be taking place on Saturday, July 21st and the public is invited to come out and watch. It’s the annual Joel Clarkston Memorial Scale Event, and named in memory of former member, Clarkston, who was a longtime Regional District area director and who tragically died in helicopter crash in September, 2003. He was a highly respected member of the association. The event begins at 10 a.m. and continues throughout the day at the club field at 2658 Gunter Road in Merville. The public is welcome to attend. Fortunately club president McCrindle has not only provided the land for the association’s activities, he also operates a business that can provide club members with much needed items for their hobby. Flite Supply, says Feenstra, has proved to be very handy for the membership. Not only does McCrindle offer the physical components of the hobby, he is also handy for advice, says Feenstra. RCAA Comox Valley is located at 2658 Gunter Road in Merville near Flite Supply. For more information visit: www3.telus.net/rcaa-comox/index.html.